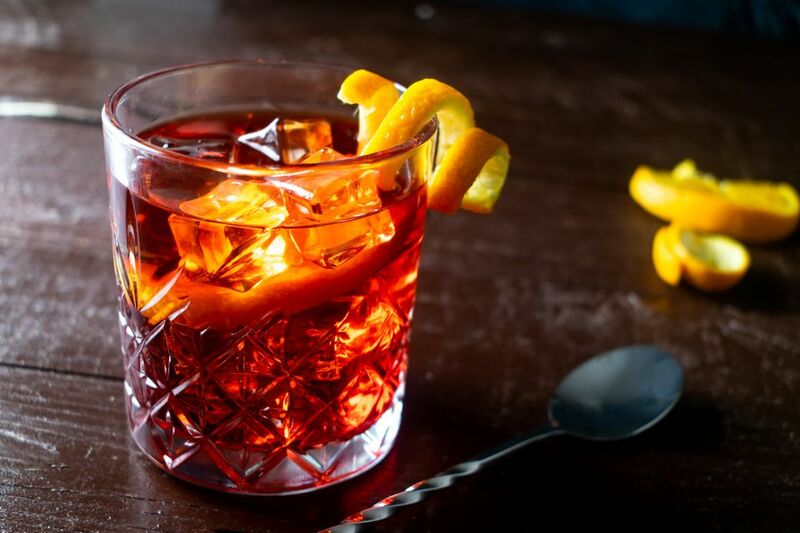 When it comes to a classic drink to enjoy before a meal, few will satisfy your palate quite like the famous Negroni. It is a simple and sophisticated aperitif featuring gin and Campari and you will find it to be the perfect addition to your next dinner party. Campari can be an acquired taste that some people will love while others will not. The nice thing about this cocktail is that the sweet vermouth offsets some of the bitterness of the Italian spirit. This also makes the Negroni a nice drink to use when training your taste buds to enjoy bitter aperitifs. The Negroni is very easy to mix up and there are no special tricks to making it taste great. While it's typically stirred, it can also be shaken, strained, and served in a cocktail glass with a lemon twist. This can make it just a little more refreshing and, ​whether shaken or stirred, it's a great way to start off any meal. The gin is going to make or break your Negroni. Be sure to choose a high-end gin such as those that you would mix into any of your favorite Martinis. This is not the drink for those times when you need to save a little money. Besides, you've already spent over $20 on the Campari, so forking out a little more for your gin will not be a waste. Adjust the Campari if needed. This is particularly important if you are new to bitter aperitifs because it is not a taste that many people—especially Americans—are used to. We have learned to enjoy sweet drinks and the occasional dry cocktail, but bitters are in an entirely different realm. When it's suggested that you need to "train your palate," we really do mean it. If you pour a full-strength Negroni and find that it's too much for you, try cutting the Campari in half the next time you mix one up. After a while, your taste buds will become used to the unique taste and you can work back up to the original recipe. Is it true? There's really no definitive answer, and, as often happens in the cocktail world, the story has been muddled over the years. Even the question of Count Negroni's existence has been brought into question. This has led to some great debates and a lot of research, as evidenced in Drinking Cup's detailed look at the origin of the Negroni. How Strong Is the Negroni? The Negroni is made entirely of liquor and, as with all drinks of this sort, it is a weak drink. It's also not the strongest, though it does give the classic Dry Martini a run for its money. On average, you can expect your Negroni to have an alcohol content somewhere around 24 percent ABV (48 proof). Take it easy and enjoy one with dinner, then switch to something a bit lighter.